As I mentioned yesterday I applied for a Google Drive invite and I received access and tested it out. Here’s my first thoughts on Google’s new Cloud Storage Solution and how it compares to Dropbox in terms of feature and value. So the first thing I noticed when I entered G-Drive for the first time was the striking similarity to Google Docs (which I love). In reality, it is Google Docs, with the addition of 5GB of storage, and a syncing capability. On the top is a download link for their document syncing software, and in the interest of science I tried it out. The utility is very simple and easy to use. After logging into your Google account, it automatically creates a folder in your documents that syncs to Google Drive. For those of you unfamiliar with cloud storage, it’s just a regular folder like any other on your computer where you save stuff, except for the fact that anything you save in there is automatically saved to you google drive account in the cloud as well. This allows you to access your files anywhere. The utility works exactly as dropbox’s does. 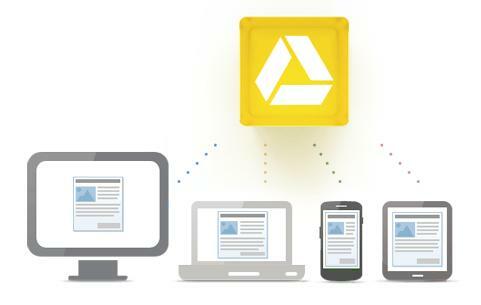 The main difference between Google Drive and Dropbox is Google Docs. The new integration allows you to access all of your Google Docs offline by auto-syncing your docs from the cloud to the folder which means that in addition to cloud storage you always have a backup on your hard drive. You can access any document and edit it from any word processor such as Microsoft Word or Pages and still access and edit it in the cloud on Google Docs as well. I see this as a major asset for Google because their Google Docs service is awesome and I (along with millions of others) already use it daily. Don’t want to sync all your files? No worries, because you can upload anything you want to back up to your drive/Google Docs using a very nice online uploader. You can even use Google Drive as a VIDEO HOST! I tested it, and they offered sharing, private storage, and embedding capabilities with the fine-tuned privacy controls of Google Docs, and the awesome video playback of Youtube. Well done there. The other nice feature is that GDRIVE gives you 5GB for free as opposed to Dropbox’s 2GB without the extra space awarded for referrals. The next comparison I wanted to make was pricing. 25 GB of Additional Storage (which also works with photosharing service Picassa) is only $30 a year while Dropbox offers 50GB for $100 which is about 70% higher prices. Google also offers custom plans up to 16TB meaning that storage will never be an issue. Another nice feature is that when you upgrade your storage, Google upgrades your Gmail as a bonus. For their 25GB plan, your Gmail is bumped up from 10GB to 25 and the same applies for their other plans. If you want to host your own website as well, check out our post on hosting of websites which is a separate issue. Overall, Google seems to be offering a much better deal than Dropbox. They offer more storage and better features for less money. That’s the simplest way to put it. If you’re comfortable entrusting google with a little bit more of your data, Google Drive is likely the cloud storage for you. Quickly share this post with your friends using the buttons below.